While I enjoy an animated movie, my animated movie viewing has decreased since my daughters are all grown up. So I have not watched any of the earlier LEGO movies (The LEGO Movie, LEGO Batman or LEGO Ninjago). I heard that they were great movies for kids and even funny for adults, but I was still a bit skeptical when I sat down to watch The LEGO Movie 2: The Second Part. Returning for this newest entry in the franchise are the voice talents of Chris Pratt (Guardians of the Galaxy, Jurassic World) as Emmet, Elizabeth Banks (The Hunger Games and Pitch Perfect movies) as Wyldstyle, Alison Brie (Glow, Community) as UniKitty Nick Offerman (Parks and Recreation, Bad Times at the El Royale) as MetalBeard, and Will Arnett (Teen Titans Go! To The Movies and Saturday Night Live) as Batman. This newest addition also adds the voices of Tiffany Haddish (Night School, Girls Trip) as Queen Watevra Wa’Nabi and Stephanie Beatriz (Brooklyn 9-9) as General Mayhem. Also appearing as live actors in the film are Will Ferrell and Maya Rudolph. Directed by Mike Mitchell (Trolls, Shrek Forever After) and the musical genius of Mark Mothersbaugh (Thor: Ragnarok, Pitch Perfect 2), this film has an all-star cast and crew. In this second installment, Bricksburg has become something of a Mad Max post-apocalyptic wasteland. An alien being (General Mayhem) invades the city and kidnaps some of its residents (Lucy, Batman, MetalBeard, Benny and UniKitty) with the goal of Batman marrying the alien’s queen. Emmet sets off to rescue his friends and stop the impending “Our-Mom-Ageddon”and become the hero that he feels Lucy wants to see in him. Along the way, Emmet meets a manly adventurer named Rex Dangervest, who Emmet starts to emulate as he thinks that Rex is the coolest guy around. Rex is everything that Emmet isn’t and Emmet feels that if he becomes more like Rex, Lucy will finally respect and love him. There is an additional underlying storyline with the live action actors that bleeds into the plot of the animated storyline. This movie was an enjoyable movie to see as an adult. I appreciated that the movie included humor that adults will find funny. Kids in the audience also had a great time seeing this movie. 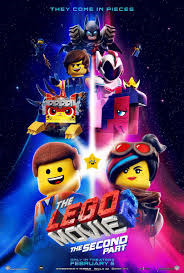 The LEGO franchise is known for catchy, memorable songs (still can’t get “Everything is Awesome” out of my head even though I have never seen the movie) and this movie is no exception. The big song this time around is called “Catchy Pop Song” and it gets stuck inside your head. I would also recommend staying through the beginning of the credits to hear an earworm of a song by The Lonely Island (Andy Samberg’s group). As a mom, I truly appreciated the live action storyline and it brought some heart this otherwise comedic film. This is a good movie to take your kids to or to go see as an adult to escape the world. I’d give this movie 3 out of 5 Lego minifigures. Angelica has her Masters in Teaching and uses that daily in her job as an educator and Boy/Girl Scout Program Specialist at the USS Midway Museum in San Diego. She loves movies of all sorts (except horror) and is a reality TV show junkie. Newer to the convention scene, she is getting her feet wet and hopes to be covering WonderCon, SDCC and DragCon LA in 2019. Previous:Dylan O’Brien Accused of Stealing Queer Role In ‘Weird City’! I’m So Tired!